Back on task, having returned last Saturday night from our 9500 mile/ 61 day trek to the West Coast and back, I am at last ready to post my contribution to our last Challenge. Gomenasai, for my extreme, two-week tardiness in posting. All my good intentions went out the window when I discovered that I couldn't get in 'the zone' and create when not in my studio. That was a surprise to me. 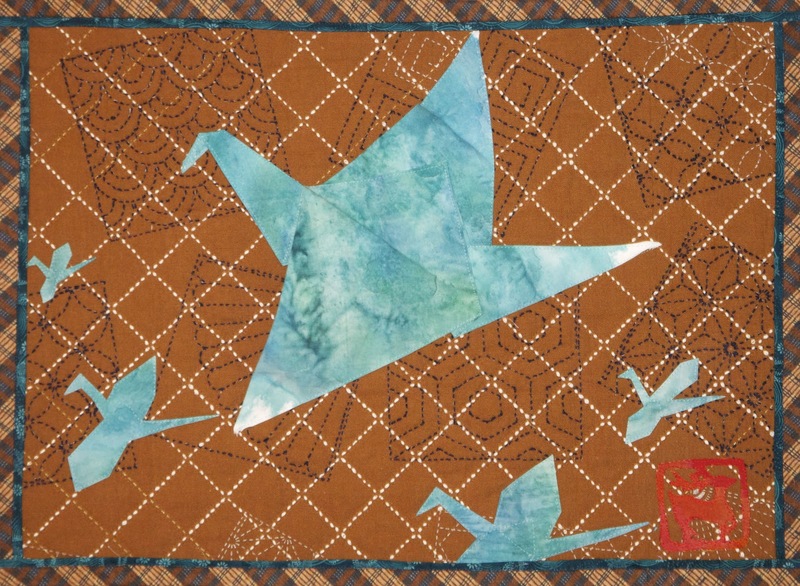 This piece, "Hatsue's Origami Lesson", recalls my teen years living in Japan. Hatsue-san was our housekeeper. She kept more than our house. She kept my Mother from loosing her sanity with four children ages 5-14 in a foreign land and speaking not even rudimentary Japanese. Shopping. Buying flowers or soba from the street mongers. Understanding the neighbor's greetings, differentiating between 'your dog dug up my flowers' from 'it's a nice day today, neh?' Navigating the narrow roads with no understanding of street signs. Oh, it was a l-o-n-g list. I can only imagine the tales Hatsue had to tell her husband and teenage daughters when she returned each night. The first winter we were there one of the things Hatsue decided that we kids would like to learn was origami, Japanese paper folding. We were very surprised that she could make something very interesting and fairly durable from paper. Clever woman kept the four of us occupied with a pad of paper whilst my Mother had a quiet moment(s). Full disclosure here: the background sashiko stitching was purchased from my friend Sue Ball Faeder while she was vending at the North Star Quilt Exhibit this past Saturday. It was a mostly completed class sample that I think she'd wearied of and it fit my plan perfectly. 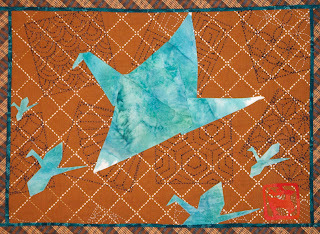 The plan: I had decided to create a complex background, suggesting Japan, upon which I would appliqué a piece of my hand-dyed fabric, folded into an origami crane. Sue's sashiko was perfect. Lastly, I enlarged a print from a 'chop' that had been created for me by Masaru Tanaka, a friend of my son Alan. Alan has lived in Japan for the last twenty-three years, keeping our family's connection to Japan quite up to date. Diane, It's always interesting to hear stories of your family history. I like how your piece makes so many traditional Japanese references. I wonder what the corollary would be for American traditions? Great chop! Oh my gosh, this brings back so many memories! I have a fond recollection of learning cranes from our family fried Akiko Grant, WAY back in the day!